Habituation and extinction are an incomplete, to be charitable, explanation of what happened with Jonbee. Rather than simply habituating Jonbee to touch and teaching him that fighting for control is a waste of energy, Cesar did do what he set out to do. He got Jonbee to submit to being handled inside by continuously administering aversive stimulus with two chokers. Jonbee became exhausted and gave up. Uh. Mission accomplished, I guess. It is either exhaustion or learned helplessness. This photo comes from W.E. 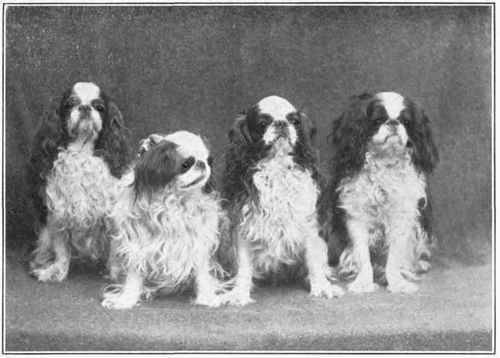 Mason’s Dogs of All Nations, which was published throughout the 1910’s. This breed of toy spaniel has a very strong influence from the pug. As I have noted before, the original toy spaniels were more like the papillon, although without the spitz characteristics. 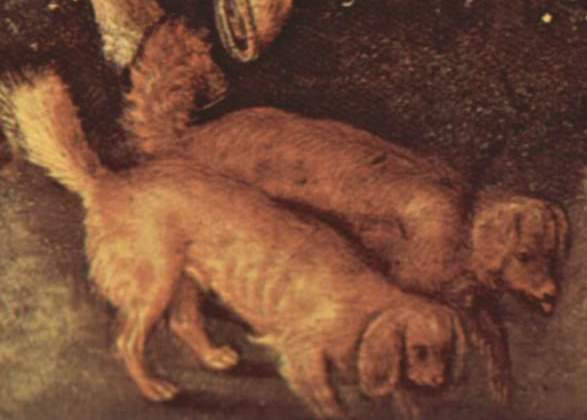 Crosses with the pug are believed to have flattened the face, but the Belgian griffons, the Japanese chin, and the pekingese could have also played a role. There was also a short-haired companion dog that was very similar to a toy spaniel that was never given a name. Someone tried to reconstruct this breed in the 1990’s by crossing whippets and Cavalier King Charles spaniels. The breed was called Tudor hound, but I have heard nothing from that particular breeding program since the late 90’s. Nothing is cuter than a toy spaniel with a flattened face. They remind me of muppets. These little spaniels originally had a function. They were often used as hunting dogs. The spaniels were probably not contemporaries of the real St. Eustace, who was a soldier in Trajan’s army. But they were contemporaries of Pisanello, who lived during the fifteenth century. These spaniels resemble solid red phalenes (which we North Americans consider a variety of Papillon). They are phalenes without the spitz influence. 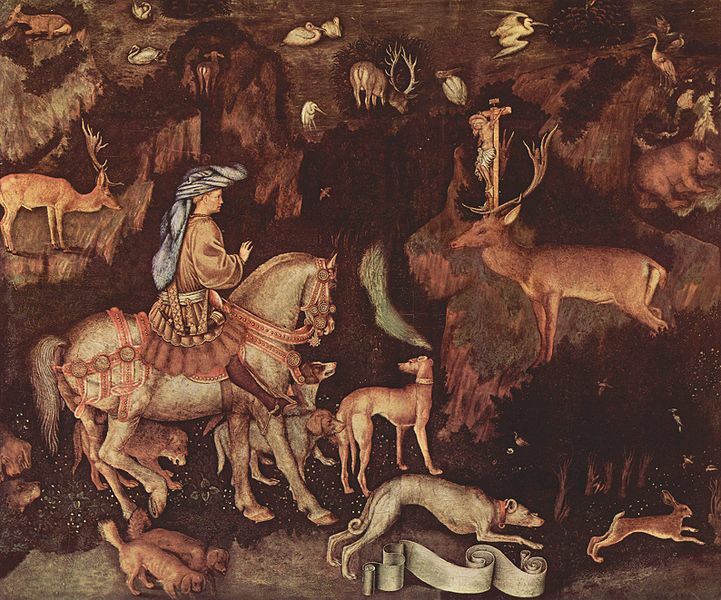 And the fact that Pisanello portrayed them them as hunting dogs very strongly suggests that they were of some use on the hunt. Small spaniels have always been the tool of the beater, who wants to drive a bird or lagomorph from dense cover. But their cuteness also made them very popular among the nobility as pets, and that’s why toy spaniels are not often thought of as flushing dogs. However, both English toys and Cavaliers have flushing instincts, and the papillon/phalene breed is known for being very easy to train. Because the English toy is so brachycephalic and because the Cavalier is so unhealthy, they aren’t the first choice for anyone wanting to train a working spaniel. But I have heard of Cavaliers being trained to hunt rabbits. So it is possible that one could be working as a flushing spaniel. This footage was taken on Svalbard. Arctic foxes are notoriously unafraid of people, and early Arctic explorers even kept them as pets. They are very closely related to the swift fox of the North American prairie. Traditionally, kit and swift foxes were considered to be the same species, but it was found that in terms of their genetic make-up, kit and swift foxes vary as much from each other as swift foxes vary from Arctic foxes. Arctic foxes usually have quite large litters. However, very few kits in an individual litter will survive to weaning. Even fewer will survive to adulthood. These little foxes often follow polar bears out onto the ice, where they scavenge the bears’ kills. They are the jackals of the ice. I suppose that any animal that has developed enough courage to scavenge off a polar bear is going to have enough courage to scavenge off of people. And that may be why it was so easy for trappers and explorers to take these animals. In the polar regions, a fox must take food where it find it. Excessive caution can be death sentence, just as too little caution spelled doom for countless species native to islands. Curiosity really did kill the fox. The brown hyenas of Namibia’s Skeleton Coast are known to hunt Cape fur seals in this manner. Sir David Attenborough also makes a mistake in this piece. It’s the first time I ever caught in saying something wrong about an animal. This is my favorite dog book. It is probably the most important dog book to come out since Lorenz’s (very flawed) Man Meets Dog.